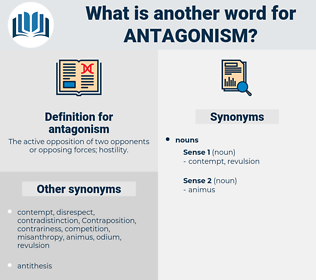 What is another word for antagonism? The active opposition of two opponents or opposing forces; hostility. disagreement, strife, competition, friction, resistance, divergence, sprinter, contrast, contrasts, controversy. animosity, contradiction, rivalry, opposition, hostile, conflict, inconsistency, feud, confrontation, hatred, runner. sympathy, understanding, good will, respect, accord, rapport, like, love, harmony, approval, kindness, agreement, liking, friendship, peace. amicability, amiability, hospitality, regard, kindliness, affinity, attraction, congeniality, civility, neighborliness, empathy. The accumulation of wealth in recent years in the United States, he asserted, had been due to natural causes, and much of the antagonism aroused thereby was without warrant. How did he account to her for this shocking antagonism of cruelty and caresses? suspicion, cold war, war, tension, latent hostility, state of war. dislike, hostility, ill will, enmity.